In March of this year (2014) I took part in an online x-factor style science communication competition called, I’m a Scientist, Get me out of here! I’d heard of the event before, and knew other people who had been involved, but for some reason I’d never looked into taking part myself. However, since moving to Paris, I’d been looking for more ways to keep my involvement in UK outreach going, so a two-week online event with school students seemed perfect. And it was! I design and test pixel detectors (like those in your digital camera) for the ATLAS detector at CERN and I also study what happens when a Higgs boson turns into taus (heavier versions of electrons). From the descriptions, the scientists are then assigned to a zone, where they will be competing against four other scientist for the all-important student votes. The students get to vote four times through out the competition. Once up until the Monday of the second week and then once-per-day after that. After each vote a scientist is evicted, until there is only one left. The winner in each zone is given £500 for an outreach project of their choice. “Nuclear” isn’t all about power and electricity. Nuclear physicists study the nucleus of an atom; the protons and neutrons. And look at how these control the characters of an element. Where the nucleus emits radiation, we find radioactive materials. There materials can be used for a great many purposes in research, including power generation, medical treatments, archaeology, and detecting other molecules. I was eligible because protons are the particles we accelerate and collide in the LHC to do our research. Also, when I test new pixel modules, I use radioactive materials (mainly strontium) to study how they respond. Hence I became an honorary nuclear physicist! The next task for me was to fill out my profile. I wrote about “me and my work”, “my typical day” and possibly most importantly, “what I’d do with the money” (in my zone this was sponsored by the STFC). It took me a long time to chose what to do with the money because I felt it there were many excellent uses for it. In the end, I decided I wanted to keep it close to particle physics and would use the money, if I won, to take the International Masterclass to schools not currently able to take part. There were four excellent scientists with me in the Nuclear Zone: Thomas, Simon, Daniel and Becky! I had a fantastic time learning about what they do and it was a pleasure to talk to them over the two weeks. Even though it was supposed to feel like a competition, it didn’t as we chatted while waiting to talk to the students and hung out in the staffroom during the day. It was also great to get to know the scientists from other zones and the IAS moderators who had the unenviable task of keeping everything working properly. The event itself is split into two sections: ASK and CHAT. The ASK section is where the students send in their questions to the site and select which scientists they want to answer them. I had many fantastic questions from a wide range of topics; from antimatter to aliens! I was often asked about my research at CERN working on pixel detectors and the Higgs boson, which showed that the students were really interested to know more about the work happening there. The second section was where we went for the live text CHATS. Each class signed up to take part in our zone had a half an hour time-slot to talk to the scientists in real time. At first I thought that thirty minutes might be quite a long time, but boy was it not! I’m sure some sort of time dilation was going on as except for the fact that my fingers hurt from typing so much, I wouldn’t have known that we’d been there for that long! The speed and variety of the questions meant that I barely had time to pause after answering one before I had to move onto another, I’m so glad I can touch type! But it was also a lot of fun and the live aspect is brilliant because the students have the opportunity to ask for the scientists to explain in more detail. Below is a screenshot from one of the live chats. The window where our answers were was to the right of this one (in case you thought I hadn’t been keeping up!). 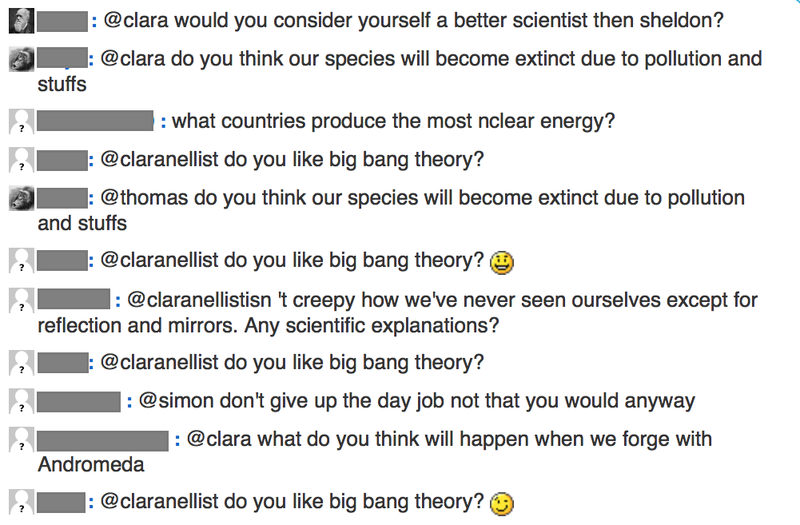 One student was particularly keen on finding out my views on The Big Bang Theory! As the days of week two went on and I didn’t get evicted, I started to hope that I might make it all the way to the end. I made sure that I answered every question that came to me, even if one of the other scientists had already given an answer (in that case, I would write a related interesting fact about the topic of the question). On the final Thursday at 3pm, it was announced that the head-to-head would be between me and Thomas. I was a former Manchester physicist and he was currently doing a postdoc there. We were both working on experiments at CERN. IAS March 2014 Nuclear Finalists. I had no idea what the difference in the votes between us was (since we’re not told) but from looking through the profiles of the students and seeing who they were voting for, it looked very close to me! At 3pm on the Friday of the second week I was very nervous – I’d put a lot of myself into the last two weeks and I realised I really wanted to win! The announcements were made live in the staffroom and I was thrilled to see my name next to the Nuclear Zone! A little while later the photos at the top of the page updated with the banner over mine which made it real. The scientists from the Nuclear Zone, March 2014. I was honoured that the students had chosen to vote for me. But whichever way it had gone, it was an enjoyable two weeks of sharing my research and love of science with enthusiastic young people. I was very glad I took part! You can lookout for a future post about how I spent the money. A few weeks after the event finished, the check and my certificate came through the post. 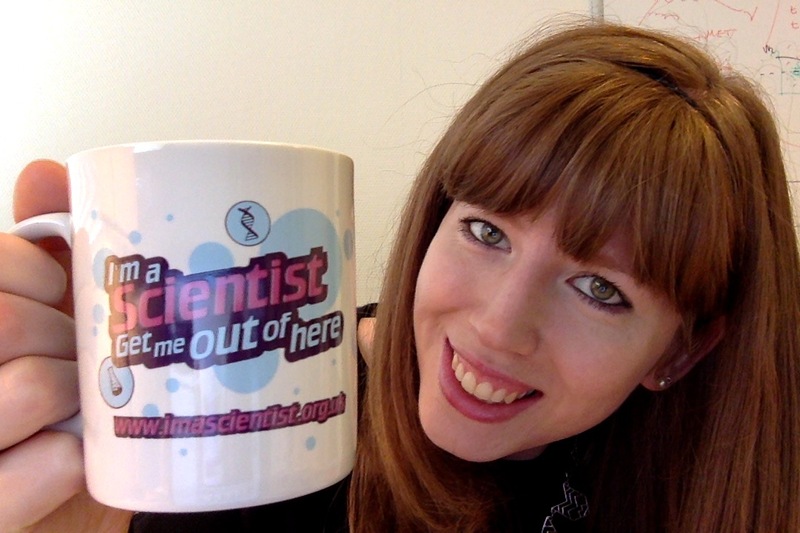 And along with them was my exclusive I’m a Scientist mug! If anyone is considering signing up for a future event, I would definitely recommend it! The June 2014 event has already started, but there will be another this year, and interested scientists should apply! You can also follow the I’m a Scientist twitter feed @imascientist for up-to-date info about the event. Engineers can join in too with the I’m an Engineer, get me out of here! event, and follow them on twitter @IAEGMOOH. I wrote a post for the IAS website thanking everyone involved. Thomas was interviewed by the Manchester Staffnet. 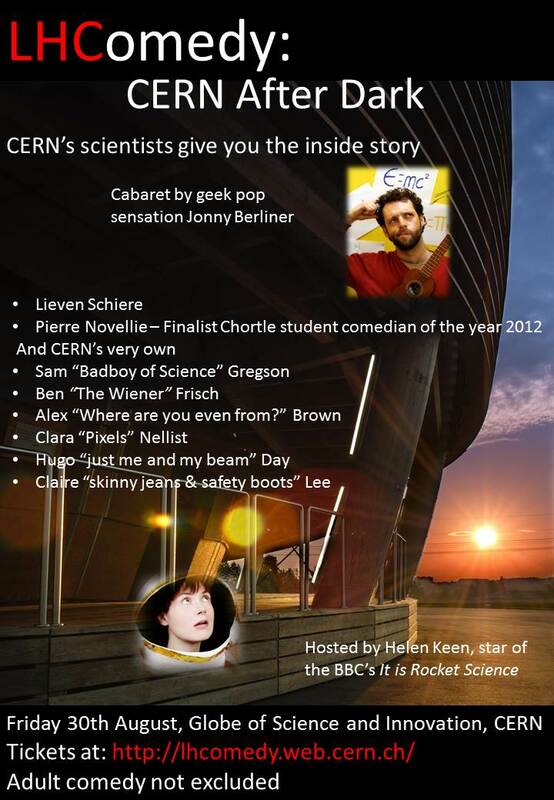 Last August (in 2013) the first LHComedy stand up show was held at CERN. I was in the final months of writing my PhD thesis, so obviously that was a perfect time to place myself at the mercy of a stand-up comedy crowd. You might be asking, “why do a science comedy show?”. The word scientist can have so many negative connotations, just look at the autofill for Google if you type in “Scientists are…”, and you can see it’s not great! LHComedy was set up to combat some of these stereotypes, and of course, to entertain at the same time! This first event took place in CERN’s Globe of Science and Innovation and was hosted by Radio 4’s Helen Keen. There were fantastic performances by all the CERN amateur comedians: Alex Brown, Ben Frisch, Sam Gregson, Hugo Day & Claire Lee. Rob Knoops worked back stage to make sure everything ran smoothly. We also had professionals, Lieven Scheire and Piere Noveli, who were brilliant and not to mention the wonderfully geeky music from Jonny Berliner. 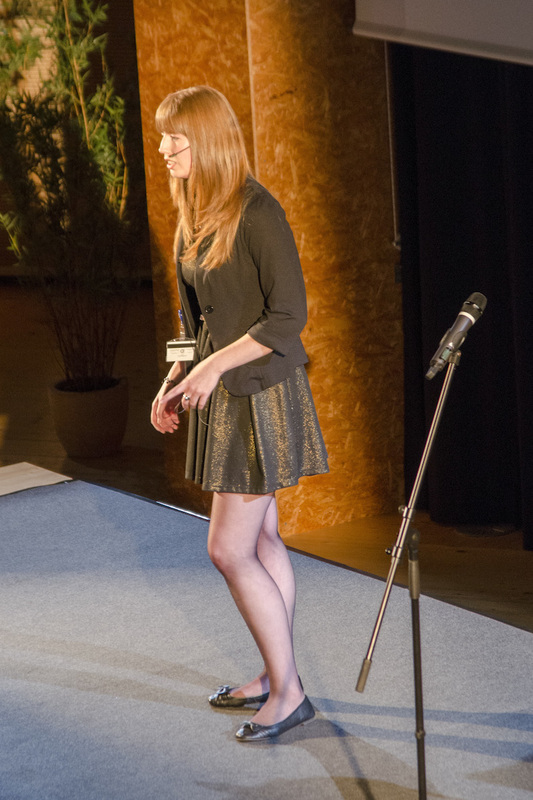 I performed a stand-up routine about particle physics and being a female physicist. I talked about being the only woman at an experiment at DESY during International Women’s Day and how my colleagues thought they could support me. I also recalled what happened when two male PhD physics students tried to show off when I worked as a barmaid (between semesters of my undergraduate physics degree). We sold out all 300 tickets a week before the event so the globe was packed — an important factor when you do a stand-up gig is actually having an audience to perform to! That they were a lovely audience was an added bonus! The event was also broadcast live online via the CERN webcast and we had approximately ten thousand unique live connections – at the time it was the highest number since the Higgs announcement in July, 2012! Me on stage for the LHComedy performance – 30th August 2014. It will again take place in the Globe at CERN and all of our tickets sold out a couple of days ago, so we are looking forward to another full audience. Do not worry though, there will be a live webcast of the event here so you can watch online. The show will be hosted by Chella Quint and we have a whole new ensemble of CERN amateur performers, Nazim Hussain, Aidan Randle-Conde and Cat Demetriades! We will also be joined by Helen Arney from Festival of the Spoken Nerd for some fantastic music, and headlining will be FameLab Spain alumni, Miguel and Eduardo from The Big Van Theory. Since I am in Romania for meetings this week, I will be watching the webcast too, and also monitoring the social media – why don’t you come over to @ComedyCollider during the show to say hi! Or you can use our hashtag, #noConCERN. The next LHComedy event, Comedy Collider: No Cause for ConCERN, takes place at CERN tomorrow, Friday the 13th of June, starting at 8pm. Walking through CDG airport has been a particular joy for me over the last few months. I’m guessing that’s not something you hear very often, but let me explain. Due to my job and personal circumstances, I fly a lot. Mostly they are short-haul flights to Geneva, or back to the UK, and it’s become such a regular part of my life that I don’t enjoy it anymore (in fact, I often grumble about it). I don’t mean to seem ungrateful! I’m certainly thankful that the option is available to me, but mostly flying is now a bit of a hassle and when something becomes part of your routine it can get boring. Recently, however, I’ve had something to brighten my mood as I walk ( / run) to the departure gate. The reason for this was a number of very large banners proudly declaring that “Science needs women”, or << La science a besoin des femmes >> if you’re reading the ones in French. Either way, the message was clear, especially since each banner contained a huge photograph of one of the five L’Oreal UNESCO Award winners. You can see some of the banners below – I was so excited, I got my phone out and took a lot of photos! Each woman is a distinguished researcher, with only one scientist receiving the award from each continent. “Science needs women”! 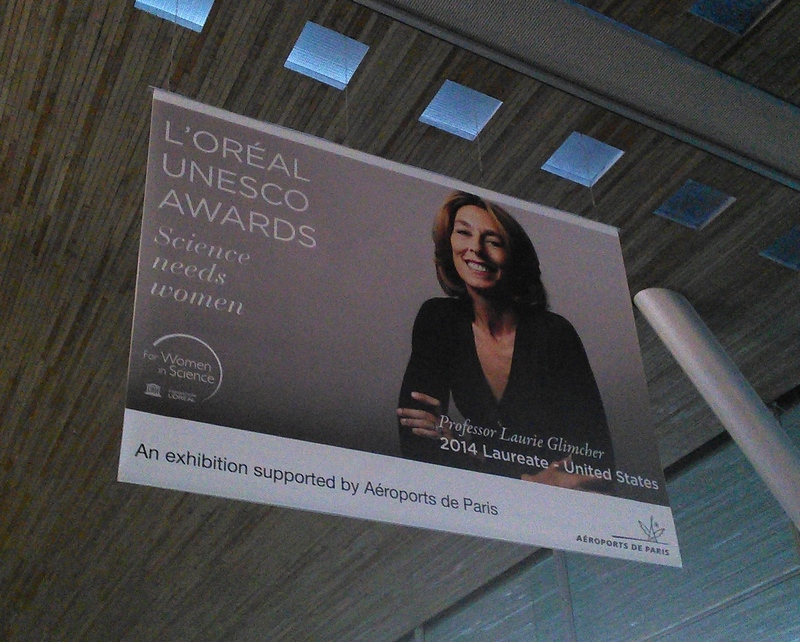 The poster for Professor Laurie Glimcher, Laureate for North America. Just seeing these made me proud! And also inspired me that maybe one day I could be on an airport banner. Not because I was selling perfume or make-up, but because I’d pushed the boundaries of human knowledge. Stories of women being held back in research make me sad and angry, and unfortunately they do happen, but here was a case where great female scientists were being proudly shown to thousands of international travellers a day! << La science a besoin des femmes >> ! 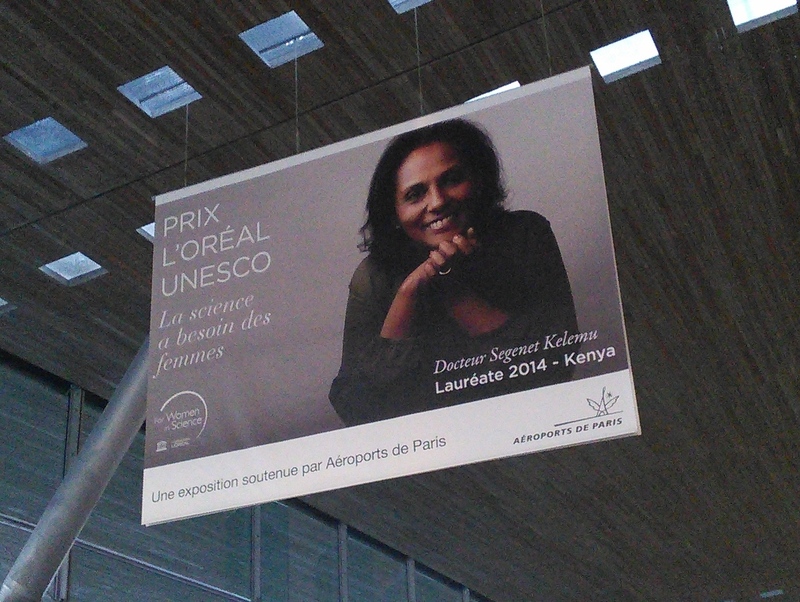 The poster for Doctor Segenet Kelemu, Laureate for Africa and the Arab States. Unfortunately, all good things must come to an end, or so they say, and the banners have now been replaced with ones advertising primary coloured versions of popular brand of smartphone. Personally, I would argue that they don’t really need the exposure and that they should put the Women in Science posters back up! At least it would brighten my trips to the departure gate again. What do you think?